This Almond Raspberry Tart Recipe is so very easy and quick to make ... and you most likely always have these ingredients in the kitchen! 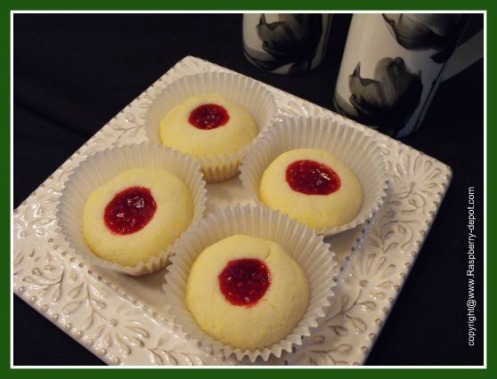 I made these with raspberry jam, but you can make them with using any type of fruit jam! You KNOW it's a scrumptious recipe when you have had so many people ask you to pass the recipe on to them! In a bowl, mix with a fork, the butter, margarine, granulated sugar and brown sugar until well mixed. Add the egg and almond extract and continue to mix. Add the flour and the baking powder (gradually) and continue to mix, you will need to use your hand as the dough will get thick. The dough should be able to be formed into a ball. If necessary, (if the dough is sticky) you can add up to 1/4 cup more flour. 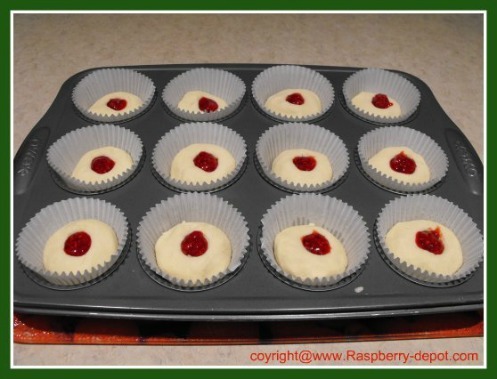 Oven Ready - Making these Raspberry Tarts is so Quick and Easy! Make small balls of dough, about 2 inches in size, and put into muffin cups (or greased muffin baking tin). Bake at 350° for about 20 minutes, or until tarts start to turn golden brown.